This haunting ghost story features standout performances from Phoebe Fox (One Day, A Poet In New York) as teacher Eve Parkins; Helen McCrory (Skyfall, Hugo) as headmistress Jean Hogg; Jeremy Irvine (War Horse, The Railway Man) as RAF pilot Harry Burnstow; and Oaklee Pendergast (The Impossible, Wer) as young school boy evacuee, Edward. England, 1941. With London in the midst of the blitz, two teachers evacuate a group of schoolchildren to the abandoned Eel Marsh House. 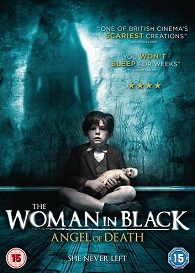 Seeking safety from the bombs in the remote coastal location, the group instead find themselves facing an evil far more frightening when their arrival awakens the Woman in Black.